Scale for selected candidates is Rs. 14,000/- to Rs. 49,000/- plus GP of Rs. 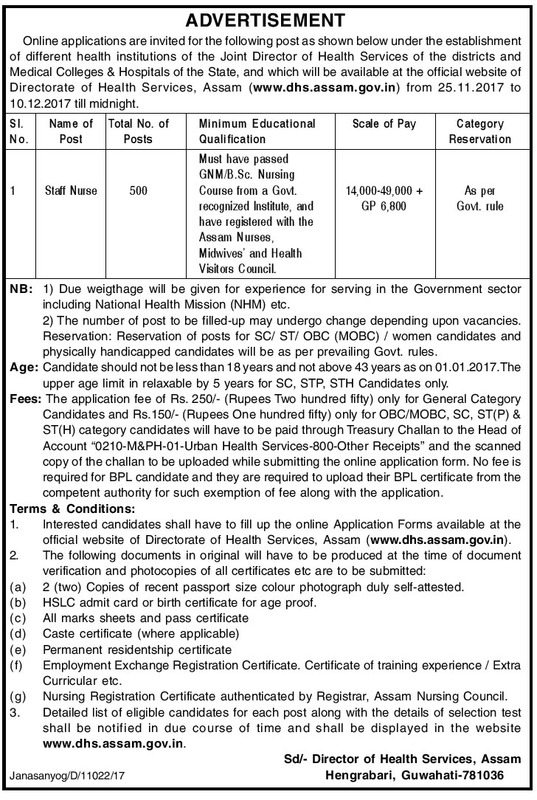 DHS, Assam Recruitment Staff Nurse vacancies are mentioned below. Health Services DHS, Assam Recruitment are 500 posts. Post Name: Staff Nurse: 500 posts. and maximum age limit is 43 years as on 01-01-2017. 25-11-2017 to 10-12-2017 till midnight. to be submitted with application are mentioned detailed in the DHS Notification. fee for other category candidates (SC/ ST/ OBC/ MOBC) is Rs. 150/-.